The story revolves around Simon Snow, an extremely powerful magician that is expected to help the wizarding world by defeating a monster known as the Insidious Humdrum, who sends monsters to Watford, a school for wizards, and steals magic from various areas. Simon also has to help solve the mystery behind his roommate’s mother, and past headmaster of Watford’s, death. Simon is accompanied by his best friend Penny, a brilliant and brave wizard, his girlfriend Agatha, and Baz, his roommate who he hates. The book takes place in this modern era, with the characters having cellphones and other elements of the 21st century. Most of the story takes place in Watford, including Baz’s and Simon’s dorm room and the cafeteria. Although a chunk of it is spent during the winter holidays, so some of the stories are set in some characters homes. Simon was born as an orphan in the normal world, and when the Mage, the headmaster of Watford, comes to take him to the school, he learns all about this World of Mages. The problem becomes for Simon is that his magic doesn’t work like normal magicians, he’s not very good at casting spells, instead he “goes off,” as phrased in the book. He explodes with massive amounts of magic, directed at his enemy. Penelope Bunce is Simon’s partner in crime, who helps Simon with her wits and the fact that she is a powerful mage herself. Agatha is Simon’s girlfriend who has to struggle with the fact that she knows Simon might die and that she’s just there to support him. She’s not very interested in the politics of the wizarding world and doesn’t enjoy being a supporting character in Simon’s story. The Mage is struggling with trying to stay in power because all of the old, rich wizarding families, like the Pitches, are trying to take it back from him, the war against the Humdrum, and keeping Simon safe and preparing him to fight against the Humdrum at the same time. Baz is on the opposite side of the war since he himself is a Pitch. He is constantly antagonizing Simon, knowing that he is going to have to fight him to help his family and knowing that he’s going to lose. He only comes to a truce with Simon and his friends when Simon offers to help him find out who murdered his mom. 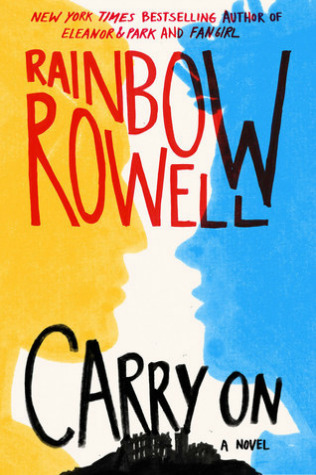 Rainbow Rowell took the general premises of Harry Potter, a book about an orphan who is introduced into a wizarding world and goes to a magical school, and completely reinvented it. While there are some basic similarities, the book is also wildly different in other ways and has a different theme to it. I enjoyed it because the characters are refreshingly charismatic and had their quirks and personalities. The plot was also well thought out and had various subplots that all wrapped around each other. One of the best things about the book is no supporting detail goes unused, and that it all adds to the main plot of the story. I would recommend this book to teenagers that enjoy fantasy novels with twists and books that don’t follow your average story plot.